The City of Edmonton is strongly committed to providing the best services to all Edmontonians, including people with disabilities. Our city is enriched by the contributions of persons with disabilities. City of Edmonton communication services including Teletype (TTY) Services. Listing of agencies and groups that provide resources for anyone with disabilities. A program aimed at businesses and citizens to help them achieve a more accessible and livable city. 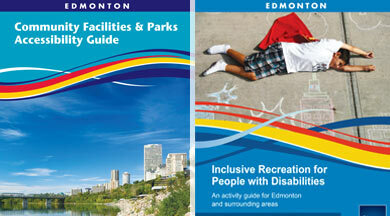 Find recreation, community, and school programs offered by the City of Edmonton. The Mayor's Awards are presented annually to individuals, organizations and businesses within Edmonton that demonstrate a commitment to people with disabilities.